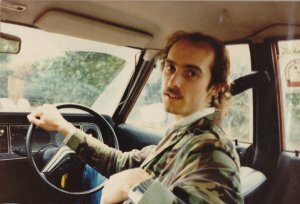 This website displays the photographs taken by me (Simon) during hunt sabotage in the early 1980s. I've created it to enable my regular sabbing partners and other companions of the time to remind themselves of those intense and hectic events. Click at the top of the slideshow images to pause. I am delighted to also include some photos contributed by two others in our group, Angie and Debbie. The banner image at the top of the page was from a photo taken at a meeting of the Old Surrey and Burstow hunt at Limpsfield Chart on 31/1/81. The redcoat striding towards my car is about to check that we have enough sandwiches. Probably. Anyway I'm sure he's friendlier than his demeanour and whip suggest. Sorry that some photos are a bit off-colour, they've degraded from all that time spent in an album, but I've done my best to restore them. 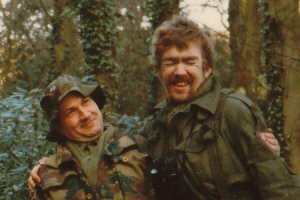 Postscript: Since creating these pages I've learnt that our sabbing mentor and inspiration Phil "Corporal" Barnes (shown above wearing a hat) has passed away. A genuine animal lover, no matter how small the animal: he was once pulled over by police because he had swerved to avoid a moth. I dedicate these photos to his memory.